Just be careful. Once this nonsense is over, there's lots of children who still need my help. Dr. Franchella: You really have to use handcuffs? Franchella: Just be careful. Once this nonsense is over, there's lots of children who still need my help. 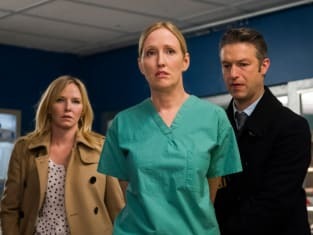 Law & Order: SVU Season 19 Episode 15: "Dare"
If Zoe's in there, that's exigent circumstances, right Counselor? Permalink: If Zoe's in there, that's exigent circumstances, right Counselor? Benson: Okay, ladies. Listen to me. You're not in trouble. We just want to find out what happened so we can help Zoe. She's your friend, right? Lili: So when we got off the bus, we dared Zoe to go up to some rando on the street and kiss him. A man. Fin: And then what happened? Lili: Zoe went up to him and we went inside. And now she's gone. Permalink: Zoe went up to him and we went inside. And now she's gone.